I would love to go to Texas for the barbecues and the chilli. I want to eat 24-hour smoked brisket and tender ribs with the meat falling off them. What I’d really like to try is the way the long, slow cooking over smoke makes everything pink, juicy and uniquely charred in a way that you’ll never be able to recreate in the home kitchen. Until recently, I’d only ever eaten insipid chilli, with perhaps a touch of cumin or chilli powder to tell you that it wasn’t a bolognese. So when I was asked to make it for my Dad’s 60th birthday, I was determined to find a recipe that would make me rethink it. I researched its history and how it is made in the chilli heartland of Texas, and finally came up with this version, which I think is truly delicious and has totally transformed my view of the dish. Make the barbecue sauce by heating some minced onion, two cloves of crushed garlic, ketchup, two tablespoons of brown sugar, the mustard, vinegar and apple juice. Pour in the Worcestershire sauce, leave to simmer for a couple of minutes, then set aside. Heat some oil in a large, heavy-based saucepan and sauté the onion and garlic until soft. Add the meat and season well. Cook for a few minutes and add the chillies and spices. Stir and add the pork ribs and cook until browned. Add the green pepper, pour in the lager and barbecue sauce, stir well, bring to the boil then reduce the heat to a very low simmer and cook for about two and a half hours. 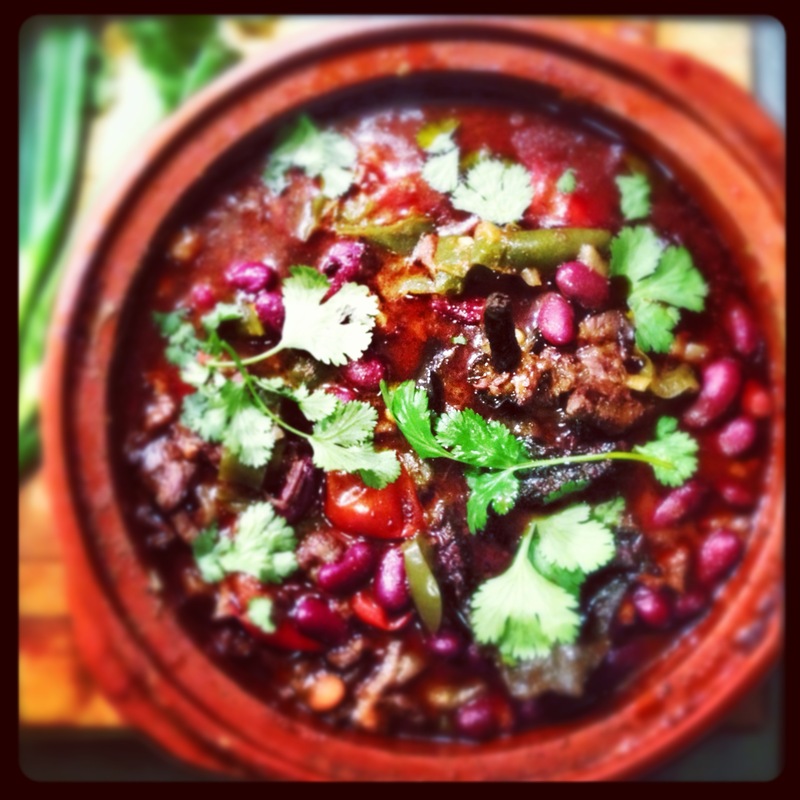 Add the kidney beans, cook for a further half hour and serve garnished with coriander.